If you need brain surgery you go to a specialist, yet brands continue to rely on brokers, agencies, etc for their insights. Their capabilities are no match for big brands. If you want to play at the level of big brands, you need to BE AT THEIR LEVEL. Today I have something really exciting news to share with you. In addition to providing a free downloadable guide at the end of almost every podcast episode and my free Turnkey Sales Story Strategies course, I’m in the process of launching a series of on-line mini courses for you over the next few weeks. These courses are designed specifically around your most pressing questions and challenges you’ve shared with me (many of which can be found on my “Start Here” page). They are game changers. This is what you need to succeed. These mini courses are bite-sized, easy to digest on-line courses that help solve a specific problem that you have. I have a couple of the courses built already and will be uploading them in the next few weeks so stay tuned! My goal is to have 6-12 courses uploaded for you by the first week in October. This is important, and I can’t stress this enough. I HIGHLY recommend that before you dive in, go through my free Turnkey Sales Story Strategies course in it’s entirety first. Consider it a prerequisite to the other courses. This will provide you with insider secrets into how to get your brand on the shelf and what retailers REALLY want. This is a free course. It will give you a strong foundation on which to build your brand. You will be able to access all courses under my Courses tab at: www.brandsecretsandstrategies.com/courses. Today’s episode is based around the foundations of my first mini course. This course is critically important because remember the expression “a picture’s worth a thousand words”? If you can help the retailer understand how and where and why to merchandise your product on their shelves, it makes selling a lot easier. Remember, a picture’s worth a thousand words. If you can help the retailer say yes to any proposal you put in front of them by showing them where your product goes on the shelf, how it’s to be merchandised, and the best way for them to grow sales by leveraging your brand, this is how you win at retail. This is how you differentiate yourself on the shelf, and more importantly, this is how you make it easy for your customers to come into the store and find your products. 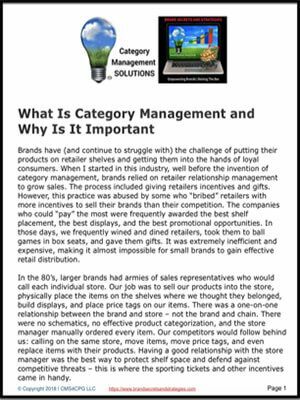 Now here’s today’s episode, proven merchandising strategies used by category leaders that win over retailers. Now I know that this is a pretty big statement, so let me unpack it a little bit. Consumers can’t buy your product if they can’t find it. Makes sense, right? Well, the problem is that a lot of brands follow the so-called tried and true method that other big brands use, rinse and repeat. By the way, that’s not a strategy.